THE BOOK OF FOOLS: AN ESSAY IN MEMOIR AND VERSE is an experimental book-length poem that invents new formal structures to marry global, ecological themes of loss—focused around the Great Pacific Garbage Patch—to personal, confessional ones. By utilizing a number of innovative lyric techniques within the larger arc of an accessible narrative, the book endeavors to create a contemporary (anti-) epic for a crisis almost beyond the scale of the human imagination. 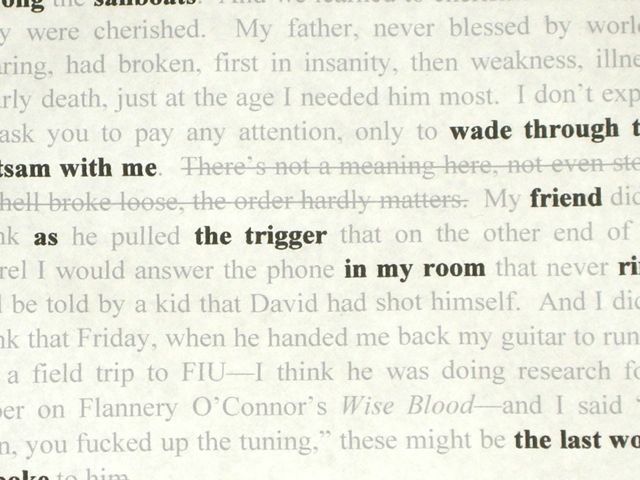 The pioneering use of self-erasure, as an expression of ecological loss and a vehicle for investigating aesthetic constructions, represents one of several unique innovations of this collection. The poem also investigates a complex mixture of further themes, including childhood, coming of age, memory, myth, the underworld, borders, and artistic representation. Excerpts from this new work have been published at The New Republic, The Tupelo Quarterly, OmniVerse, and are forthcoming from The Kenyon Review.